The basic challenge is that there isn’t a single cycle that encompasses the whole system. Grizzlies, for example, are not involved in the central loop of pine-cone-seedling dispersal and growth (R1). 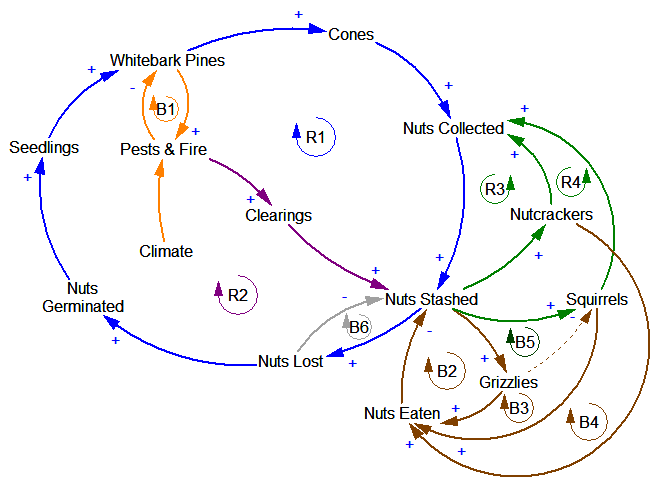 They are to some extent free riders on the system – they raid squirrel middens and eat a lot of nuts, which can’t be good for the squirrels (dashed line, loop B5). 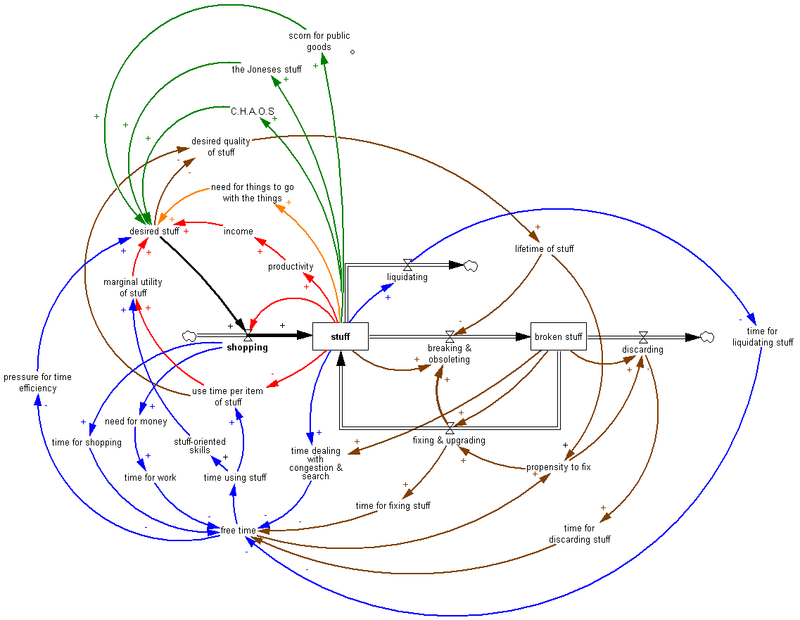 There are also a lot of “nuisance” loops that are essential for robustness of the real system, but aren’t really central to the basic point about ecosystem interconnectedness. B6 is one example – you get such a negative loop every time you have an outflow from a stock (more stuff in the stock -> faster outflow -> less stuff in the stock). R2 is another – the development of clearings from pines via fire and pests is offset by the destruction of pines via the same process. I suspect that this CLD is still dramatically underspecified and erroneous, compared to the simplest stock-flow model that could encompass these concepts. It would also make a lousy poster for grocery store consumption. A while back I decided to never buy another garden plant unless I’d first dug the hole for it. In a single stroke, this simple rule eliminated impulse shopping at the nursery, improved the survival rate of new plants, and increased overall garden productivity. Black: stuff is the accumulation of shopping, less outflows from discarding and liquidation. Red: Shopping adjusts the stock of stuff to a goal. The goal is set by income (a positive feedback, to the extent that stuff makes you more productive, so you can afford more stuff) and by the utility of stuff at the margin, which falls as you have less and less time to use each item of stuff, or acquire increasingly useless items. So far, Economics 101 would tell a nice story of smooth adjustment of the shopping process to an equilibrium at the optimal stuff level. That’s defeated by the complexity of all of the other dynamics, which create a variety of possible vicious cycles and misperceptions of feedback that result in suboptimal stuffing. Orange: You need stuff to go with the stuff. The iPad needs a dock, etc. Even if the stuff is truly simple, you need somewhere to put it. Green: Society reinforces the need for stuff, via keep-up-with-the-Joneses and neglect of shared stuff. When you have too much stuff, C.H.A.O.S. ensues – “can’t have anyone over syndrome” – which reinforces the desire for stuff to hide the chaos or facilitate fun without social contact. Blue: Stuff takes time, in a variety of ways. The more stuff you have, the less time you actually have for using stuff for fun. This can actually increase your desire for stuff, due to the desire to have fun more efficiently in the limited time available. Brown: Pressure for time and more stuff triggers a bunch of loops involving quality of stuff. One response is to buy low-quality stuff, which soon increases the stock of broken stuff lying about, worsening time pressure. One response is the descent into disposability, which saves the time, at the expense of a high throughput (shopping->discarding) relative to the stock of stuff. Once you’re fully stocked with low-quality stuff, why bother fixing it when it breaks? Fixing one thing often results in collateral damage to another (computers are notorious for this). The old advice, “Use it up, wear it out, make it do or do without” works. Don’t buy stuff when you can rent it. Unfortunately rental markets aren’t very liquid so this can be tough. Allocate time to liquidating stuff. This eats up free time in the short run, but it’s a worse-before-better dynamic, so there’s a payoff in the long run. Fortunately liquidating stuff has a learning curve – it gets easier. Make underutilized and broken stuff salient, by keeping lists and eliminating concealing storage. Change your shopping policy to forbid acquisition of new stuff until existing stuff has been dealt with. Buy higher quality than you think you’ll need. Require steady state stuff: no shopping for new things until something old goes to make way for it. Do things, even when you don’t have the perfect gear. Tax yourself, or at least mentally double the price of any proposed acquisition, to account for all the side effects that you’ll discover later. Get relatives to give $ to your favorite nonprofit rather than giving you something you won’t use. Underdress and underequip. Occasionally this results in your own discomfort, but reverses the social arms race. Don’t reward other peoples’ shopping by drooling over their stuff. Pity them. Use and promote shared stuff, like parks. This system has a lot of positive feedback, so once you get the loops running the right way, improvement really takes off. However, I think the fundamental analogy between the system CLD and a food web or other network may only partially hold. That means that the insight, that influence typically lies within a few degrees of connectivity of the concept of interest, may not be generalizable. Generically, a dynamic model is a network of gains among state variables, and there are perhaps some reasons to think that, due to signal attenuation and so forth, that most influences are local. 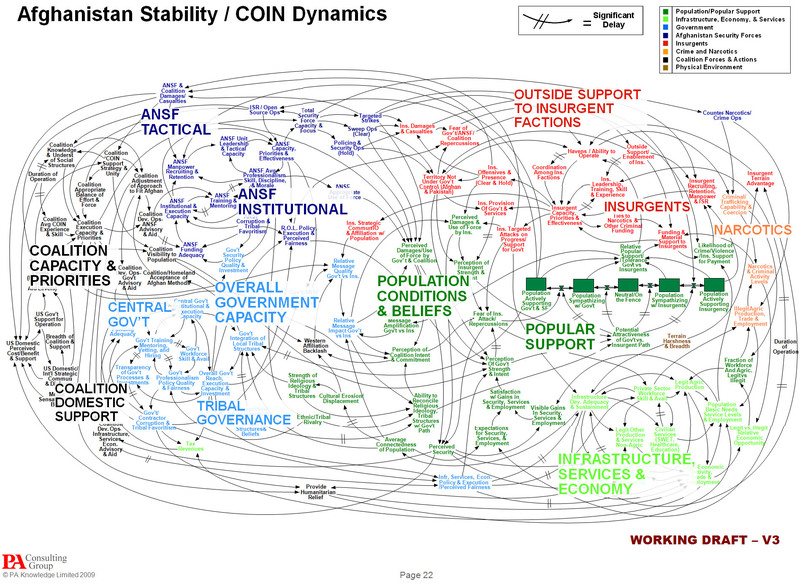 However, there are some important differences between the Afghan CLD and typical network diagrams. This bears further thought … please share yours, especially if you have a chance to look at Berlow’s PNAS article on food webs. The tradition, one might call it the orthodoxy, in system dynamics is that a problem can only be analysed, and policy guidance given, through the aegis of a fully quantified model. In the last 15 years, however, a number of purely qualitative models have been described, and have been criticised, in the literature. This article briefly reviews that debate and then discusses some of the problems and risks sometimes involved in quantification. Those problems are exemplified by an analysis of a particular model, which turns out to bear little relation to the real problem it purported to analyse. Some qualitative models are then reviewed to show that they can, indeed, lead to policy insights and five roles for qualitative models are identified. Finally, a research agenda is proposed to determine the wise balance between qualitative and quantitative models. 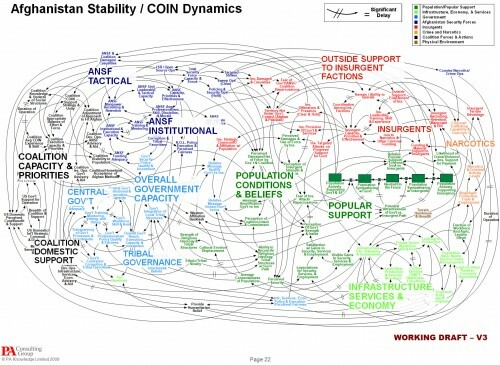 Geoff Coyle has recently posed the question as to whether or not there may be situations in which computer simulation adds no value beyond that gained from qualitative causal-loop mapping. We argue that simulation nearly always adds value, even in the face of significant uncertainties about data and the formulation of soft variables. This value derives from the fact that simulation models are formally testable, making it possible to draw behavioral and policy inferences reliably through simulation in a way that is rarely possible with maps alone. Even in those cases in which the uncertainties are too great to reach firm conclusions from a model, simulation can provide value by indicating which pieces of information would be required in order to make firm conclusions possible. Though qualitative mapping is useful for describing a problem situation and its possible causes and solutions, the added value of simulation modeling suggests that it should be used for dynamic analysis whenever the stakes are significant and time and budget permit. This rejoinder clarifies that there is significant agreement between my position and that of Homer and Oliva as elaborated in their response. Where we differ is largely to the extent that quantification offers worthwhile benefit over and above analysis from qualitative analysis (diagrams and discourse) alone. Quantification may indeed offer potential value in many cases, though even here it may not actually represent ‘‘value for money’’. However, even more concerning is that in other cases the risks associated with attempting to quantify multiple and poorly understood soft relationships are likely to outweigh whatever potential benefit there might be. To support these propositions I add further citations to published work that recount effective qualitative-only based studies, and I offer a further real-world example where any attempts to quantify ‘‘multiple softness’’ could have lead to confusion rather than enlightenment. My proposition remains that this is an issue that deserves real research to test the positions of Homer and Oliva, myself, and no doubt others, which are at this stage largely based on personal experiences and anecdotal evidence. My take: I agree with Coyle that qualitative models can often lead to insight. However, I don’t buy the argument that the risks of quantification of poorly understood soft variables exceeds the benefits. First, if the variables in question are really too squishy to get a grip on, that part of the modeling effort will fail. Even so, the modeler will have some other working pieces that are more physical or certain, providing insight into the context in which the soft variables operate. Second, as long as the modeler is doing things right, which means spending ample effort on validation and sensitivity analysis, the danger of dodgy quantification will reveal itself as large uncertainties in behavior subject to the assumptions in question. Third, the mere attempt to quantify the qualitative is likely to yield some insight into the uncertain variables, which exceeds that derived from the purely qualitative approach. In fact, I would argue that the greater danger lies in the qualitative approach, because it is quite likely that plausible-looking constructs on a diagram will go unchallenged, yet harbor deep conceptual problems that would be revealed by modeling. I see this as a cost-benefit question. With infinite resources, a model always beats a diagram. The trouble is that in many cases time, money and the will of participants are in short supply, or can’t be justified given the small scale of a problem. Often in those cases a qualitative approach is justified, and diagramming or other elicitation of structure is likely to yield a better outcome than pure talk. Also, where resources are limited, an overzealous modeling attempt could lead to narrow focus, overemphasis on easily quantifiable concepts, and implementation failure due to too much model and not enough process. If there’s a risk to modeling, that’s it – but that’s a risk of bad modeling, and there are many of those. 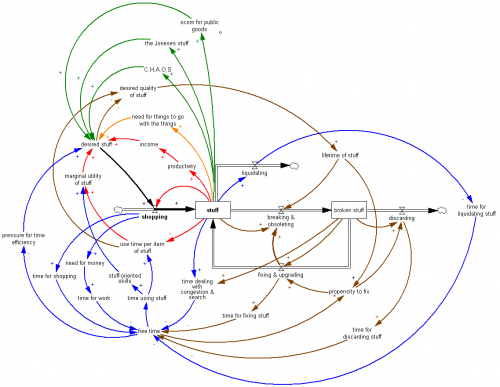 Author TomPosted on April 29, 2010 February 6, 2017 Categories Policy, SystemDynamics, visualizationTags causal loop diagram, CLD, feedback, spaghetti, stock-flow diagram12 Comments on Are causal loop diagrams useful?